I get pretty proud of myself when I make a good dinner just for me. Normally I end up eating snacks or weirdo foods instead of a real meal when I’m cooking for one. 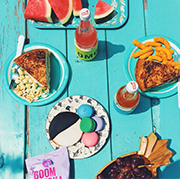 Thank you Dana, for making me crazy about turkey burgers … ever since the tasty ones you made us post paddle boating. Mix together the turkey, onion and cilantro. Add some salt and pepper. Divide into 4 patties. Cook on a hot grill for 4 minutes on one side. Flip and cook for 5 more minutes. Top with cheese and let it get melty for a minute or two. Place burgers in your whole wheat burger buns and get your dinner on. Makes 4 burgers. These little buns were easy-peasy. They rose effortlessly and were perfectly soft/firm for burgerness. Heat milk in a small saucepan over medium-high heat for a couple minutes, until really warm throughout, but not hot. Transfer to a medium bowl and let cool to lukewarm, about 10 minutes. Meanwhile, pour water into a small bowl. Sprinkle yeast and a pinch of sugar over the water, lightly whisk, then let stand for 5-10 minutes, or until super foamy and active. Add egg to the milk; whisk well. Whisk in sugar, salt, oil and yeast mixture. Stir in whole-wheat flour. Using a heavy wooden spoon, stir vigorously by hand for about a minute. Start adding all-purpose flour to the dough, about 1/3 cup at a time, stirring well after each addition. When the dough is somewhat firm and no longer too sticky to handle, turn it out onto a floured surface. With floured hands, knead the dough for 7-ish minutes, using additional flour as needed to prevent sticking. Coat a large bowl with cooking spray. Add the dough and turn to coat. Cover with plastic wrap and set aside in a warm place to rise until double in bulk, 1 to 1 1/2 hours. When the dough has doubled, turn it out onto a floured surface. Gently knead for a minute. Divide dough into 8 equal pieces (about 3.8 ounces each). Form into nice rounds by tucking edges under the center pinching where they meet. Cover a large baking sheet with parchment paper and spray with cooking spray. Sprinkle with corn meal. Place the dough balls on the baking sheet about 2 inches apart. 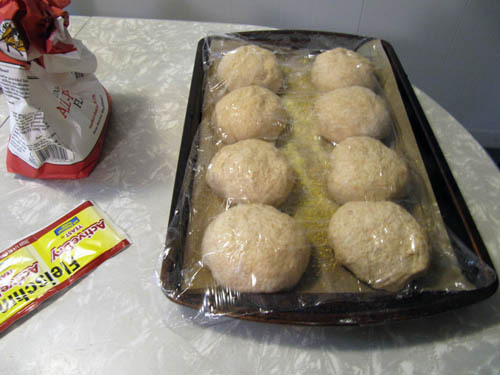 Coat a large sheet of plastic wrap with cooking spray and place it over the buns, sprayed side down. Set the buns in a warm place to rise. After about 30 minutes, gently press down the buns, right on the plastic, to flatten them a little. Let them rise for another 20 minutes. 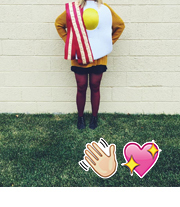 Meanwhile preheat the oven to 375º. 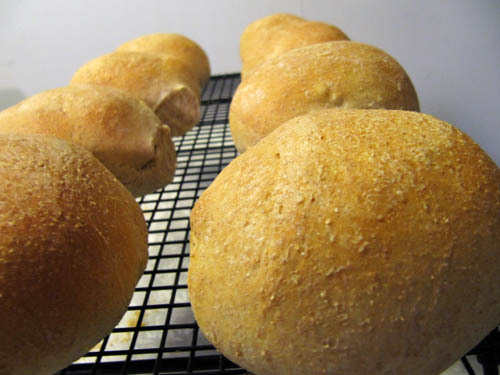 Bake the buns on the center rack until golden and crusty, about 15-20 minutes, rotating halfway through. The bottoms should sound hollow when tapped. Cool on a wire rack for at least 15 minutes before slicing. Makes 8 burger buns. 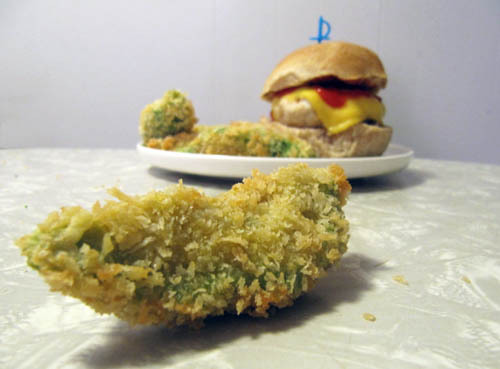 Avocado fries have officially changed my life. In the recipe it said that the amount I made for 1 could serve 3… just saying. They are so good. Crunchy and creamy and nutty. Pretty much the best thing ever. Preheat oven to 200ºF. 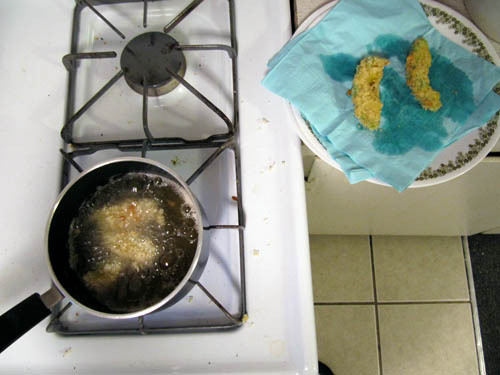 In a medium saucepan, heat 1 1/2 inches worth of oil until it reaches 375ºF on a deep-fry or candy thermometer. Meanwhile, mix flour and 1/4 teaspoons salt in a shallow bowl. Put eggs and panko in separate shallow bowls. 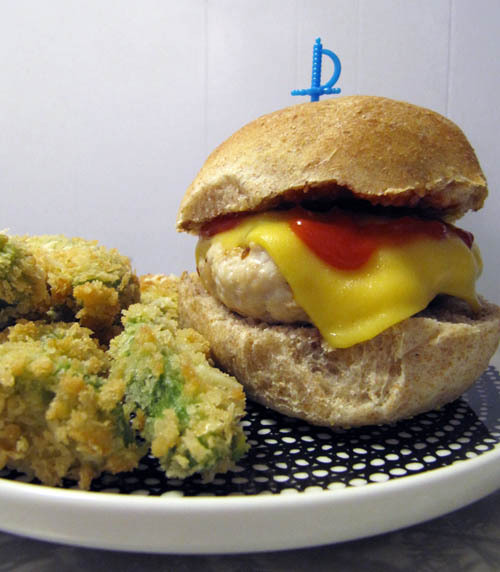 Dip avocado in flour, shaking off excess. Dip in egg, then panko to coat. Set on 2 plates in a single layer. Fry a quarter of avocado slices at a time until deep golden, 30-60 seconds. Transfer slices to a plate lined with paper towels. Keep warm in the oven while cooking remaining avocados. Sprinkle with salt to taste. Holy cow avocado fries??? That might be the best idea I’ve heard today! Yum! That happens to me too when I’m cooking only for myself, eating random snacks or here and there ingredients without actually throwing together a meal. It looks like you did a great job on this one! I always feel so much better when I make an actual meal instead of snack-dinner, but sometimes it’s just so hard to get motivated! A nice addition to the turkey burger patties is chopped pineapple and hot sauce. Moist and spicy – yum! In Asian culture avocado is more often eaten as a dessert ingredient if you can believe that, which totally made me hate it when I was little, but now I have just discovered how creamy and delicious it is! I’ve already made them again since this post. They are SOO good. Don’t you love how when you get older foods aren’t as scary. 🙂 I used to hate spinach as a kid and now I love it.